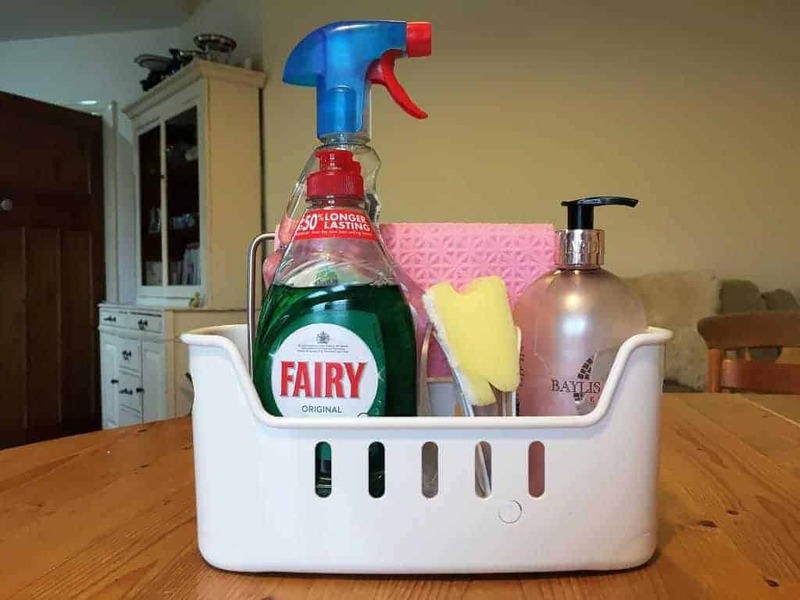 I had enough of all those sponges, clothes, a bottle of washing up liquid, soap etc. 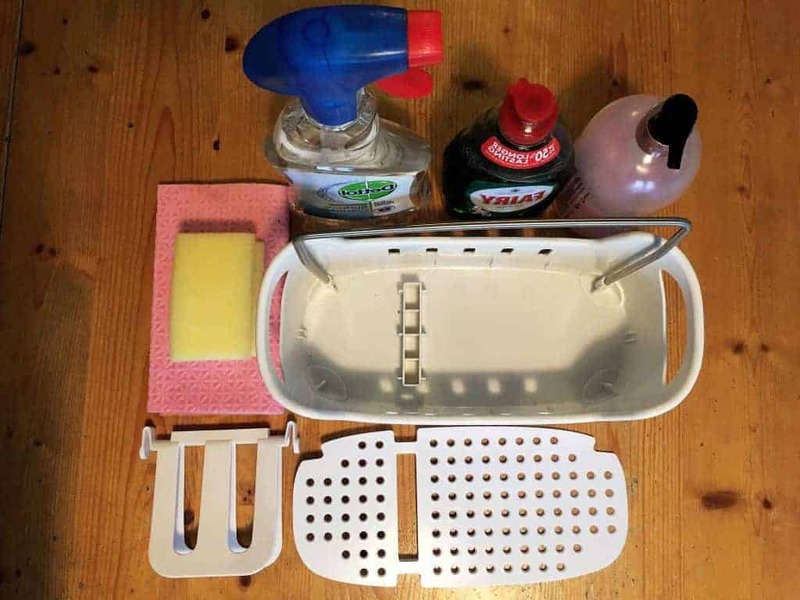 This organising system helped me tidy up our sink with just a few easy steps. I like our kitchen, the layout is practical, the style and the whole room suits our lifestyle. The one place I was never completely happy with and should’ve given it more attention sooner was the sink area. But I always found other, more motivating and exciting corners in the house that I preferably decided to focus on. To be honest it was fine for day to day life but I wished the sink area would’ve looked more organised when someone came in. I’m not talking about dishes piling on the drainer. I’m talking about all those sponges, bottles of washing up liquid, soaps, brushes etc. laying around the sink. I believe that a cleverly organised sink surrounding helps to make a better impression of my loving kitchen. 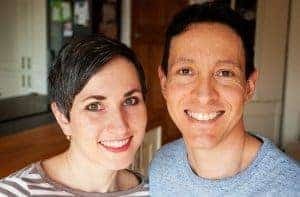 The other day we were expecting friends we haven’t seen for ages. For me having guests is always a good reason to tidy up the kitchen a bit. Once it was all done I couldn’t help it but, I wasn’t happy with the sink again. So I set my self a goal and decided to look into some smart options that would help me to upgrade it. In those occasions when I want our kitchen to make the best impression, I like hiding things inside of our cabinets and leaving the worktop empty as much as possible. That way the kitchen looks much bigger, tidy and clean. I like a simplistic, minimalistic and practical style. It was a difficult decision to make. Both organisers were big enough but I found the second one more practical even though the first one was better looking and more stylish. I really liked it’s country style look but it’s made of metal and I was worry to expose it to water on day to day basis. The practicality won over the look for me this time. 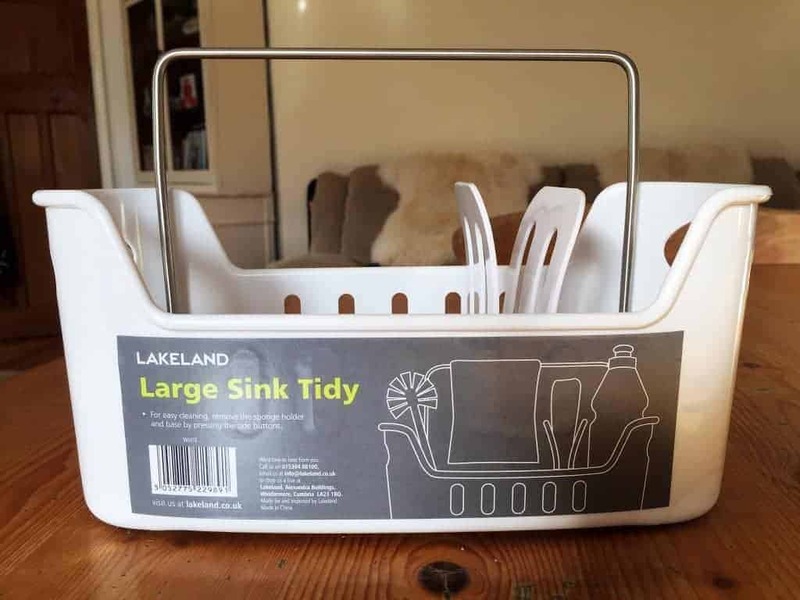 The “Lakeland large sink tidy” is plastic so I don’t have to worry about any water damage. I can easily fit all I need inside. 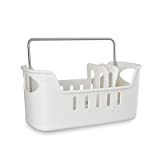 As a plus it has very useful sponge compartment and I can hang up a dish cloth over its mini rail. One thing that’s not very exciting but we all buy it for our new sink is a dish drainer. Personally, I am not impressed with all those (maybe cleaver) but huge monstrous drying racks. They are sitting right in front of people’s eyes and it’s difficult to put them away. I also don’t find plastic drainers very appealing. There is often some water trapped inside and they are just not pretty. On the other hand, bamboo drying racks look very nice. They bring a nice warm atmosphere to the kitchen and they look stylish. What I am not sure is how long they would usually last. Water and wood aren’t great friends and I am afraid that these dish dryers change their colour and lose their stylish look. Majority of pictures I look at for inspiration had at least one brush in a caddy next to the sink. I personally don’t need any brushes. I don’t think they are worth buying. I can easily clean dishes with a sponge and I’m not sad to replace it as sponges are very cheap. I guess this is down to personal preferences as I can imagine some people find brushes very helpful. Another product in question for me was a plastic washing up bowl. I don’t find it useful and it would always be in my way. I actually have one but I use it as a bowl for our plant when we go on holiday. I remember my granny used to use one in her sink. It was mainly for water/energy saving reasons. She didn’t have a tap with hot water in her kitchen and heating up water for the whole sink was just too much. One thing I wish I would have bought when our sink was new is sink protector mat. Not only it prevents a stainless steel sink from unwanted scratches but it’s must have if you have a ceramic country style sink. It protects the sink as well as your ceramic, porcelain dishes from dents and chips. What I would look for is a mat that can go safely in a dishwasher where it can be cleaned properly from all grease. Last but not least, I would like to mention a textile drying mat. I bought a few with a scepticism when there were on sale but I got to like them very much. 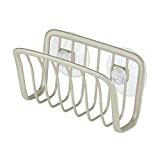 I have always one under my drying rack and it protects the sink’s stainless steel drainer. I had to use lots of vinegar to clean all those limescale marks from the shiny surface before. Now the water from dishes is absorbed into the mat and doesn’t make any marks. 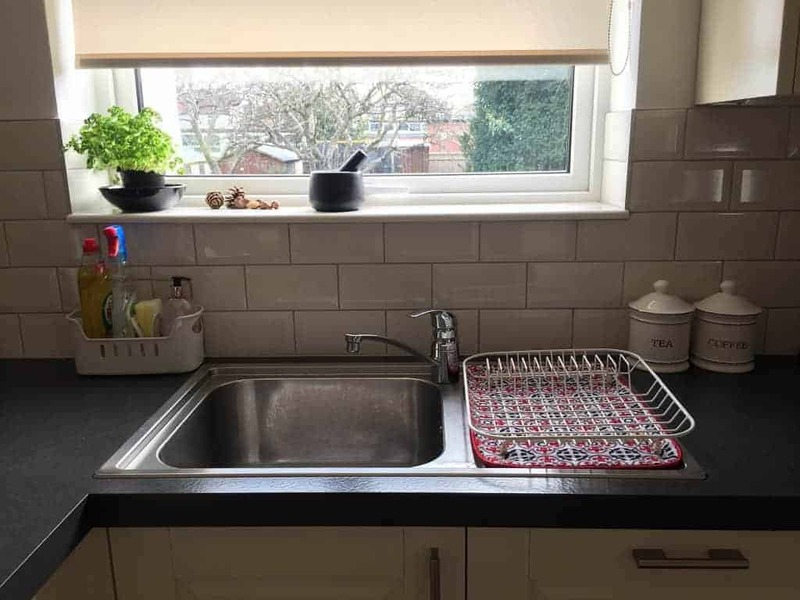 And if I have more dirty dishes for washing up I can always put another of those drying mats next to my drainer and expand the drying area. The mat is safe to wash in the washing machine and it dries quickly too.